3) If any question, leave us a message, we will keep in touch with you. Large Capacity - Sutable for carrying your for iPad, mobile power, mobile phone charger, wallet, key and other small items, and it can accommodate part of the movement, travel items (shoes, socks, Sportswear, basketball or soccer and other sports equipment). 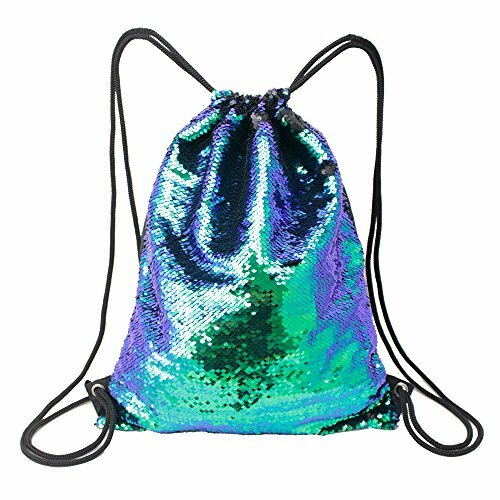 Multi Use - Sequin bags are playful conservative colorful and fit for multiple activities, including swimming, walking, day trips, camping, sports practices, overnight stays, vacation, travel, yoga, running, shopping, jogging, gym sports or school PE lesson. Nice Gift - It is the best gifts for your mum, daughters girlfriend or best friends.perfect for Christmas party, white elephant party, anniversary, bachelor party, or special day. Drawstring Backpack Including Waterproof PVC Wet Bag- Sackpack for Men & Women Drawstring Backpack Bag Adjustable Straps. Gym Sack for Sport, Swim, Yoga. Carry On Travel Backpack. Diaper Backpack Bag!